Petko Kiryakov was born on 6th December 1844 in the village of Doganhisar (now in Greece). He became a rebel - hardly 16 years old - after Turks slaughtered in front of his eyes his bigger brother Mate and his cousin Valcho. The great number of violent actions and the arbitrary acts of the Turks turned the young person from a personal revenger into a protector of the rights of all poor people – Bulgarians, Greeks and Turks. Soon after that, the name of the youngest Rhodope rebel spread from mouth to mouth, and the brave and unexpected attacks of his band made the beys tremble of fear. The head of the bold leader was assessed to 10 000 stivers, but he could not be found by the pursuers. In the autumn of 1864, the Greek committee preparing an upraising for the releasing of the Krit island, invited Captain Petko in Athens. There he spent the winter, studying military science. Having decided to help the Greeks, he left for the island of Kapri to ask for assistance from the Italian patriot – Garibaldi. Leading a small group of volunteers of Bulgarians and Garibaldi people he fought for the freedom of the Krit island, but the failure of the upraising made him return to the Rhodope region in Bulgaria. 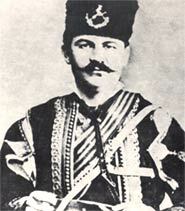 There in 1873, he gathered the first Bulgarian – Rhodope group “Druzhina” with democratic internal rules similar to the Greek and Garibaldian ones. Article 1 said that the aim of the group is to protect morally the Bulgarian people suffering under the Turkish yoke and to support in any way its development - in religious and political direction. Greater part of the fines he took from the Turkish notables because of their law violations, he gave to churches, schools and to the poor people. With the advance of the Russian army to the South in 1878 and the conquering of Plovdiv, the 300-person group of Captain Petko released a number of Bulgarian and Greek villages, as well as the Greek town of Maronia. Soon after that, however, the group had to leave the White sea region in order ot help the Bulgarians from Eastern Rumelia, fighting against the Berlin Congress decisions. The leaders of the Haskovo Committee “Unity” asked Captain Petko for help. He said that in case of need his group would not be late, but that the most important was that Haskovo got well prepared for resistance. The voivode himself went around the region to follow the digging of the trenches, he attacked the disobedient villages – fortresses of the Turks. After the second request of the Haskovo people in mid-march 1879, Captain Petko arrived in Haskovo to prepare the population for the expected attack of the kurdhzli tribes, who waited for the Russian to leave the town and immediately attack and ravage it. After several fights with the group of the voivode, however, the braveness of the attackers quickly left them. Afraid of Bulgarian upraising, the Sultan accepted the proposal of Russia not to send army to Eastern Rumelia. This decision was also greatly influenced by the inexhaustible activity of Captain Petko. He stayed in Haskovo by the end of May, when he dismissed his group and was seen off by the local population with gratefulness. The legendary freedom fighter died on 7th February 1900 in Varna. 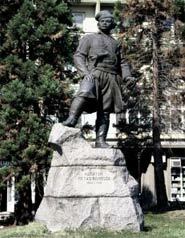 The monument of Captain Petko Voivode in downtown Haskovo was made by Stoyo Todorov in 1963.